Not that I feel I'm an expert on all things chocolate, but when I realized my response to the following comment was getting a bit lengthy, I thought maybe I should just make a post out of it. In response to my last post, Michael Doss wrote: "What can you suggest to a guy with underdeveloped chocolate tastes? I generally enjoy M&Ms, don't care for Hershey Bars, and See's Candy is usually just fine for me. Oh, and I like milk chocolate — dark chocolate, to me, is like fine, very expensives coffees or liquers — good, but not something I enjoy as my 'everyday'." I don't always agree with my fellow food-obsessed writers in terms of what is or isn't "good" chocolate. I once read a review that said Ghirardelli milk chocolate was "middle-of-the-road" with an "old, mushy flavor." Which I think is completely wrong, especially since I recently made an absolutely delicious chocolate pudding out of that very same product. 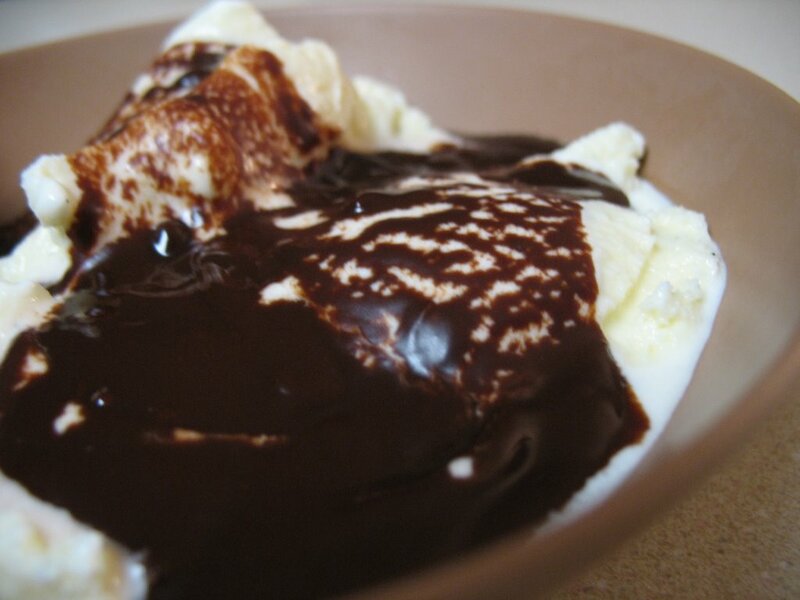 And the hot chocolate sauce that was poured over the homemade vanilla ice cream in the photo above? Made with semi-sweet chcolate chips from both Ghirardelli and Nestle. The result? Perfectly acceptable. And I mean that in the most positive way. Because, honestly, I'm not a chocolate connoisseur. Really. I'm not the connoisseur of anything, to tell you the truth. (For instance, I couldn't tell you the difference between a Parmesan cheese aged 15 months or 20 months. I'm not that kind of "foodie.") I just know what tastes good to me, and I know when something is really excellent the first time I taste it. And who isn't happy with ribbons of chocolate drizzled over melting vanilla bean ice cream, no matter what the quality? So to go back to what I said originally: Eat chcoclate in all its forms. Try a new brand here and there. You never know what you'll find. Try some fancy truffles with rainbow colors painted on their tops and flavors like curry or key lime. Pick up some Toblerone or some of that Scharffen Berger stuff everyone's always raving about. I honestly don't think there's any way you'll be disappointed. I agree with you. I eat all kinds of chocolate and can enjoy many of them on different levels. I've eaten stale Godiva and it was awful. It made me appreciate Hershey's kisses. And I've had extremely expensive top line chocolate that transported me to heaven. I like your style of foodieness because while you love to eat well, you realize there's value and deliciousness in comfort foods, stuff other people consider "low brow" and foods from your past. I'm up to the challenge of enjoying a variety of chocolate; your suggestions are great! I so totally want a curry truffle now. Sher - Ugh. Any sort of stale chocolate sounds completely unappetizing! Mike - Let me know how the chocolate exploration goes. I myself have never had a curry truffle, but I may just have to seek one one now that I've talked about it!